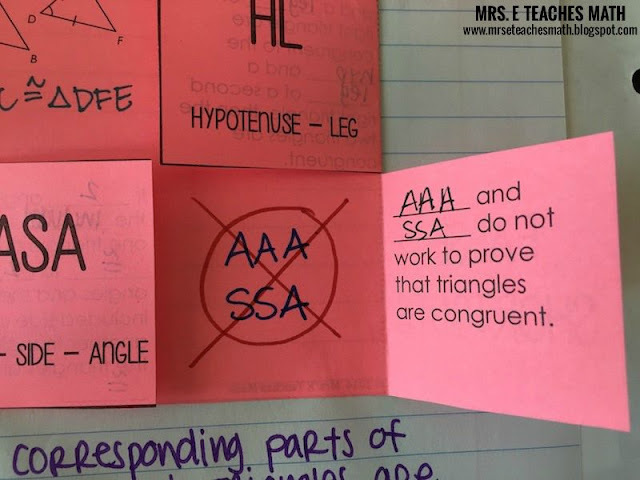 My geometry students always seem to fall within two categories: they love triangle congruence (because they think it's easy) or they hate triangle congruence. There seems to be no middle ground. My students that hate triangle congruence seem to have the biggest problem remembering the theorems. The letters of the shortcuts just seem to swim in their heads. So, I created this foldable to help them sort it out. 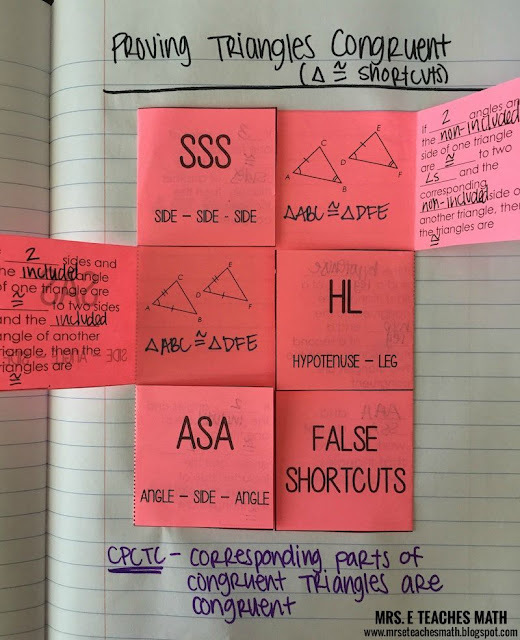 All of the triangle congruence shortcuts are listed, including the "false shortcuts" that students seem to fall for. Inside each of the tabs is an example and the theorem written in words. I always like to include theorems written in words so students can become more comfortable with math language. You can find the foldable here. Every year, my students ALWAYS seem to use SSA as a shortcut. I try to ham it up and make a big deal out of not using it. I say "Ahhh! We don't use bad words in math class - forward or backward!" and "There are no donkeys in here!". I try to go over the top with acting so that my students will remember. I like to show this video to help students visualize why it doesn't work. 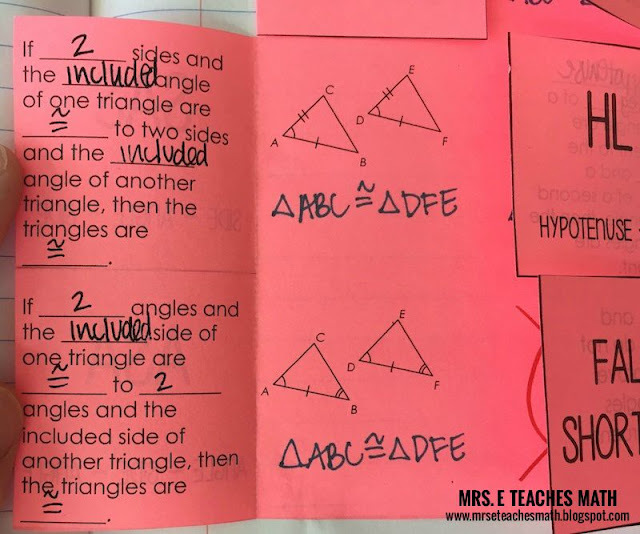 What is your favorite activity when teaching triangle congruence? 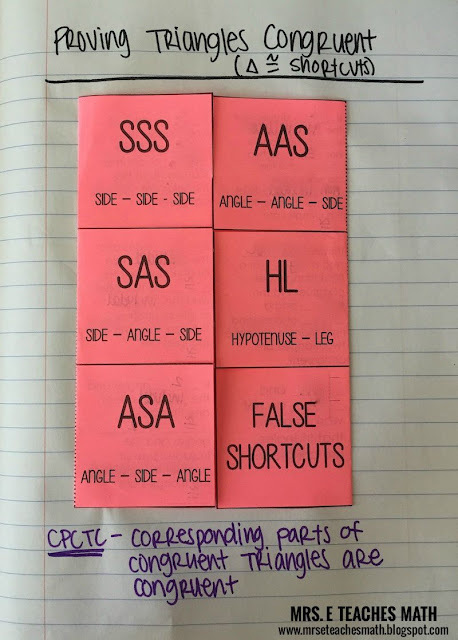 I just used this today with my 8th grade geometry students. They loved it, and it was a great way for them to organize all the new information. Thanks! Great resource! Where is the download for the foldable? Thanks! Excellent resource. I would defdefinit try to use it in my class. The only concern is the time limit.in my schools we have 1 period of 25 minutes. How do we fifi Ishaan an activitu in tbetgiven time slot. Also, chichild here need to be tratrai for such hands on activities. Excellent resource. I would definitely try to use it in my class. The only concern is the time limit in my school for a teaching period is 25 minutes. How do we i finish an activity in tbe given time slot. Also, children here need to be trained for such hands on activities. 25 minutes is a very short amount of time! I have 50 minutes, so double the amount. I'm not quite sure what I would do with that short amount of time. I also have to train my students how to complete hands on activities.